Since Scrivener debuted in 2007, I’ve used it to write two (terrible) novels and a (terrible) screenplay, among other projects. It’s a favorite among Macworld staffers, too, earning a 2010 Editors’ Choice Award. Its many refinements to the already great original make Scrivener 2.0.2 worth every penny. Like its predecessor, Scrivener 2 offers an extensive suite of writing aids without ever forcing users to confirm to any set process. Whether you want to jump in and start typing, or prefer to compile meticulous research and outline the whole narrative, Scrivener’s happy to hand you the tools and get out of your way. 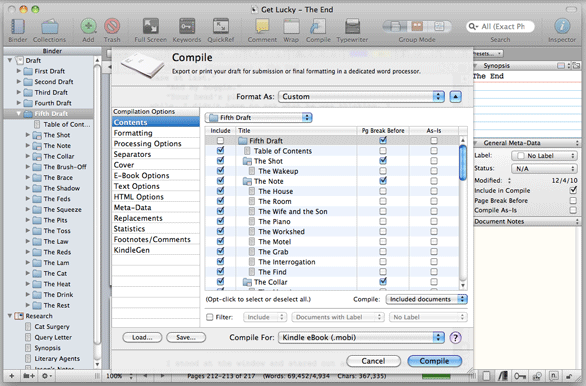 Compiler: The new Compile Draft window streamlines the process of exporting your finished manuscript to print, PDF, or even an e-book. The new version makes it even more seamless to switch between viewing individual documents as text, virtual index cards, or sections on an outline. Each view comes with its own refinements. Text can now be viewed as individual pages, rather than an uninterrupted scroll. A new freeform mode lets you break index cards out of a rigid grid, rearrange them on the fly, then apply those changes to your project’s structure. And a handy pull-down menu makes it easier than ever to customize the different headers (from preset categories such as “word count” or “progress” to user-created metadata) in outline view. The new Collections let you gather subsets of documents (say, every chapter in which a certain character appears, or all your research on the city of Petra) in tabbed folders at the top of the left-hand Binder column. Placing files or folders in a collection won’t alter the project itself, and searches saved as collections will automatically update as you add new relevant documents. I found the Collections interface confusing at first; it’s hard to tell which collection you’re clicking on, or how to get to the others from whichever one you’ve called up. But like nearly all of Scrivener’s features, it’s completely optional and easily hidden. Scrivener 2 also simplifies editing and revising. With up to five layers of color-coded revisions, you can clearly show who added what, when, to which document. (Note that this isn’t like tracking changes in Microsoft Word ( ); you can remove the color from revised text, but you can’t selectively peel back alterations you make.) Comments or footnotes within the text now appear directly in the right-hand Inspector column. A host of smaller features round out Scrivener 2’s appeal. Fans of full-screen editing can now add their own background images. You can customize the icons that show up in the left-hand Binder column. Where Scrivener 1 only let you view two documents simultaneously, fully editable pop-up Quick Reference windows now keep any files within your document easily within view. Afraid you’ll lose your work? Scrivener 2 makes automatic backups to a separate ZIP file every time you close a project. And I especially liked the Name Generator, which spits out random character names based on a host of fun and detailed options. Scrivener 2 saves its biggest improvements for its Compile Draft window, one of Scrivener 1’s few weak spots. Previously a crowded, intimidating monolith, it’s now a streamlined checklist of all the options necessary to turn your files into a finished manuscript. I was delighted to discover that I could now focus on compiling the contents of individual folders, sparing me from manually deselecting every file in my first through fourth drafts just to get a PDF of the fifth. In addition to PDF, RTF, and Microsoft Word exporting, Scrivener 2 can save projects as iPad-friendly ePub documents or a Kindle e-books. When I tested the latter, the resulting file worked perfectly on a Kindle DX ( ). One problem from the original Scrivener remains in version 2: It’s almost too eager to please. While it’s easy to ignore all the advanced features you don’t need, hunting for the ones you do can quickly turn baffling. Scrivener tries hard to arrange everything logically within its menus, but given how many bells and whistles it packs in, keeping those features intuitive is difficult if not impossible. Thankfully, the comprehensive, cheerful PDF manual always helped me get back on track. 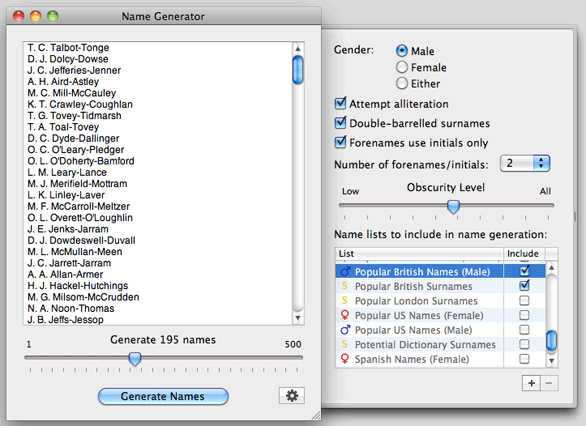 Name game: Even the playful Name Generator tool has no shortage of powerful options. If you only want a simple app to bang out your masterpiece, Hog Bay Software’s WriteRoom ( ) is just as well-crafted and considerably cheaper. But if you think you might need any of the dozens of terrific tools Scrivener 2 provides, you won’t find a better value—or a better writing program—for your money.